When you need affordable and convenient Marlton auto glass replacement, Clear Vision is the clear choice! We offer mobile auto glass replacement wherever you may be in Marlton or Burlington County. Whether you need a new windshield, mirror or side window replacement, our technicians can get you running again. Clear Vision is available 24/7 for emergency roadside assistance. Repairing Chipped/Cracked Windshields. If a crack in your windshield is smaller than a quarter in size, you should have it repaired. Cracks and chips can grow larger, resulting in a more expensive windshield replacement. Call on us to request a fix, and we’ll send out a technician to repair it and save you on future costs. Replacing Windshields. When your windshield has larger cracks or is shattered beyond repair, we’ll install a new one for you. If your budget is tight, try requesting our aftermarket equivalent glass, which is significantly cheaper and works just as well. Our techs are trained to install windshields properly for all vehicle types. Side and Rear Mirror Repair. It’s extremely dangerous to drive a car with a cracked side mirror. You run a much greater risk of accidents when you take your eyes off the road to check blind spots. Cracked mirrors are also unsightly, especially for business vehicles. 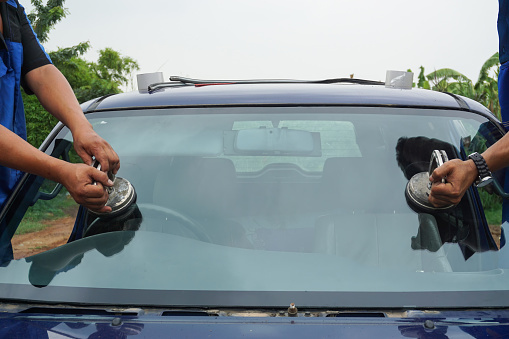 Clear Vision can replace your mirror, even if it’s a power mirror, and make your car safer. Power Window Repair. If you need a power window replacement in Marlton, tell us the make and model of your vehicle. We’ll come to you with all of the necessary parts, and completely install a new window, repairing motors if needed. We’ll make sure your car is free of shattered glass as well. And we’ll do it for much less than you would pay at a dealership. Don’t risk having limited vision or receiving an expensive citation. Call us today for your Marlton auto glass replacement needs or click here and request a quote. We’ll help you see the road clearly again.